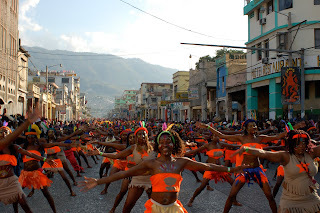 Carnival is the biggest national music festival in Haiti. It brings tourists from all over the world to Haiti. 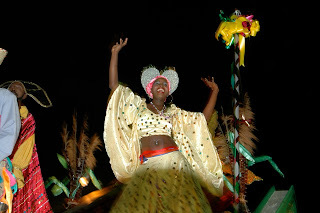 Carnival is a time when people are expressed their problems, their political views, their agreements and their disagreements with the government through their songs. It is also a time that you know whether the government’s work is in favor of the people or not. It is the time when people put away politics, spots and news, and are focused on carnival. Every year, on the first week of February, three days are given by the state for carnival. Prior this three days, the second week of January, the pre-carnival festivities take place every Sunday and everywhere in the country with DJs and rara bands (bands that parade in the street). People will not negotiate these Sundays for anything. They start preparing these Sundays after the end of the last carnival season. Some people leave their homes to come to Port-Au-Prince, the capital, for the three-day national music feast. Once newspapers and other recycle materials are gathered, masks are made with them. Composers write songs and band musicians finish rehearsing them before the summer is over. The bodybuilders go to their gym clubs to get their bodies ready to show up while dancing. Special t-shirts are made by businesses to give to people in order to promote their products, and by bands to hand to their fans as a lovely gesture. Furthermore, businesses will advertise their new products by sponsoring bands and building stages in Champ de Mars, the big park where the carnival takes place every year. Money is given by the state to sustain the bands. The city rents places to businesses to build stages. Moreover, salesmen and saleswomen will travel to the countryside to buy hats made with dried stems of palm trees. School and university students will parade and dance their special dance for this event. In addition, the National Palace (the President’s office), and the streets will be decorated for this special celebration. 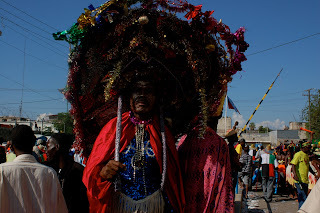 However, week prior the weekend- carnival starts, a special press release will have been sent out to all media by the PNH (National Police of Haiti) to inform the population what they can bring and what they cannot bring with them during in the parade, and to inform the merchants which bottle of drinks they will be allowed to sell during these three days. In addition, more agents and special units in the National Police force will need to be deployed on the streets in order to prevent peaceful folks from being attacked by the folks who lost their minds while drinking. It must be noticed that the Haitian Red Cross, the General Hospital and International Red Cross assist the National Police in its duty during these three days. Finally, a special ceremony has held at the National Palace for Queens and Kings of the carnival, and the president launches the three-day carnival festival. Thus, no matter the best strategy that will be put in place by the police authorities and other medical agencies, the public and private hospitals will have more wounded people to be taken care of, and a few hundreds people will be arrested or put behind the bars for post carnival. Nevertheless, a Haitian wherever he or she is, including me will feel home sick, if he or she cannot go to Haiti in February for our biggest national music fest, our National Carnival.